Harlow and Knox were ‘ride or die’ almost from the beginning. Their love, farther and deeper than the distance from the Earth to the Moon–it was calculated from the Earth to the stars. But the age difference was made a thing by nearly everyone and the two lost touch of each other. A chance encounter with Harlow is all Knox had hoped for. The Starbucks visit is short, but sparks fly like the last six years had never happened. It is at a fundraiser for Knox’s firehouse that he sees the abuse firsthand, and Harlow has to make him promise not to say anything–which is really hard for the man. A slight reprieve in the abuse allows him to sneak a cellphone to her. All seems to be going well, until her husband finally goes off the deep end–and Harlow is unable to protect her family. After leaving her for dead, unconscious in a bathtub, Harlow summons the strength deep within herself to leave her husband for good. But where can she go? 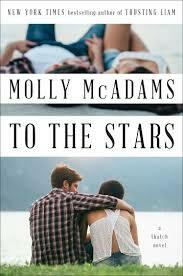 Who would read this: Fans of Molly McAdams are probably fans of the New Adult genre. To The Stars is a really good version of this genre. Time to Read: At just under 400 pages, it took me a little longer to read this–will set it at 3 hours. Rating: solid 3.5-4 stars. I felt like there were a few missed opportunities in the plot, but McAdams stuck with it and made it her own, succesfully. Funny Story: This is the 2nd book in the series. I haven’t read the first because I couldn’t get into it. After reading this, I am going to retry the first–I like the characters! Final thoughts: I enjoyed this book a lot more than I thought I would, despite a few of the plot holes. It made for nice, but a little stressed, reading. If you want to support this blog, at no additional cost to you, consider purchasing this book via this Amazon link. Thanks for your consideration.